Hibiscus flower has long been popular in Mexico (as “jamaica“) because of the tartly flavored, jewel toned tea that it makes. This is the same tea held to be the Pharaoh’s favorite in days gone by and is the traditional drink for toasting the bride and groom in some North African countries. We have loved it for the flavor and have enjoyed it for years in our household, but the new promising research on hibiscus has our attention and makes us think we need to enjoy it much more regularly. One study showed that three cups of hibiscus flower tea consumed daily for six weeks lowered blood pressure in Type 2 diabetes. It may help lower cholesterol as well, according to another study. (I have since written a more extensive discussion of its effect on heart health here.) 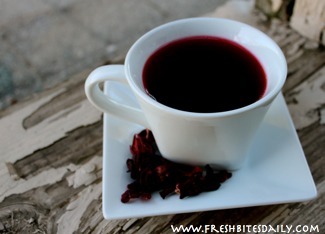 It is also commonly used to treat colds and coughs. Given that there are no side effects to hibiscus flower and the cost of hibiscus flower is quite reasonable, there is no reason not to give this idea a try. 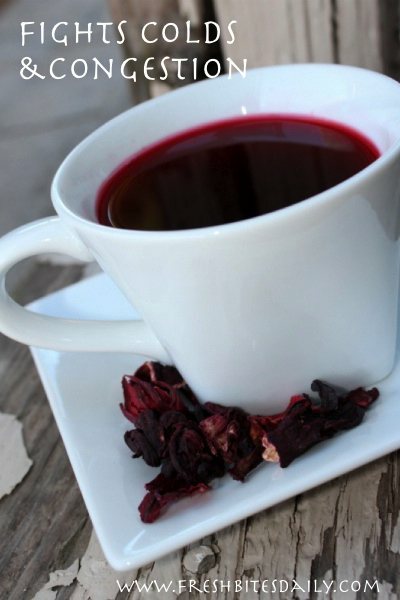 If you are drinking hibiscus tea therapeutically for something like blood pressure, develop a system of making a large batch of a strong infusion and keeping it in the refrigerator, perhaps like the hibiscus syrup I describe here. You could eliminate the sugar altogether and just keep a very strong infusion in your refrigerator to add to a cup of warm water. You can find hibiscus at any Mexican market (look for “jamaica”) and at some health food stores that have a bulk herb section. For online purchases, we recommend our favorite vendor here who sells good quality product.